Consent orders are seldom worth the paper they are printed on. The state/Federal settlement of early 2012 is no different. In servicing, consent orders have repeatedly been violated, in part because servicer economics favor having the banks cheat now and pay not-punitive-enough fines later, in part because their systems are so bad that it would be difficult for them to shape up even if they had a change of heart. But according to the report of an employee who worked in the servicing area in 2011 and 2012, Bank of America has flagrantly violated its 2012 consent order with 49 state attorneys general, the Department of Justice, HUD, the Fed, Treasury, and other agencies. And one reason why may be that it is on schedule with its plans to have disposed of the servicing of virtually all Countrywide loans by the end of March. Perhaps it figured no one would be able to identify and charge it for these abuses before it handed the loans off. Translation: people are losing their homes when they shouldn’t. Maybe I’ll pretend to be concerned sometime in 2013. Stay tuned! The requirement is very clear: if the borrower gets his application and the supporting documents in within the stipulated time frame, the home is not referred to foreclosure until the review is completed and a thirty-day appeal window has passed with no borrower action (we’ll skip over what happens if a borrower appeals a rejection). YS: – willing to do modifications in very specific – No, I mean, that’s a serious – you know, were they serious or not? BE: No, I’m laughing because I’m taking the stance of the bank if, they would be probably laughing at your statement because it was very clear that we did not want to give the modifications and it was built into our incentive structure. YS: Wow, and that’s – I assume that’s particularly shocking for a bank like Bank of America, because one thing I’ve heard is that it’s very process driven, that it likes having everything kind of nailed down and written, much more so than most banks. BE: Right. Well, as far as that’s concerned, they do do that, but, see, they do it in a very vague and open-to-interpretation process. You get a lot of the instructions and manuals, like, I may have a couple manual documents that kind of just show how they’re like, well, “in a situation where this may be called for,” and then it doesn’t define what the situation means or doesn’t define what may be called for or its limitations or its extremes. (laughs) It’s just vague material. YS: So it’s process theater is what you’re saying. A lot of it is process theater. BE: I was forced to basically dual-track two people….and it’s kind of a critical point in that, okay, dual-tracking is defined as, you know, not pursuing foreclosure at the same point of pursuing a modification. BE: What the bank does is the bank takes the liberty of defining what “in a modification” is. If a customer has submitted to me all their documents – okay? – and I need an underwriter to review the file? They are not in a modification. Nor are they under review for a modification. They make that explicit point that they are not in review for a modification if our underwriters have not approved or – no! I take – did not approve the file. BE: So what they have filed in – say, a file is in underwriting, I have a foreclosure date coming up in two weeks – oh well. It’s probably going to foreclosure because if I don’t have a response back from the underwriter, I am not able to postpone the foreclosure or make the request. Now understand what is happening here. Contrary to the clear language of the settlement agreement, which says that no foreclosure referrals are to take place if a borrower gets his paperwork in within the stipulated time frame until the review process is complete and he’s been given the opportunity to appeal an adverse decision, the bank has decided to ignore the settlement terms and not stop the process until (more accurately unless) the application gets to an underwriter in time. And that’s not the first step in the process. The file (at a minimum) first goes to a reviewer like our source, who has an incentive to reject it, since he gets paid more to reject than approve mods. Only if it miraculously gets past someone like him to an underwriter will the foreclosure process be put on hold. BE: – foreclosures like get postponed with no request made and we would have no idea how it happened. BE: So they are aware that California has a very specific law about that. How did the bank respond to the single point of contact requirement? With a raised middle finger. MHA, it was a complete disaster. I mean, people would be calling in, they would talk to four or five different reps, they’d all give them wrong information, and, you know, they’re….just languishing in nowhere land. And as soon as that actual consent, when that one order came out where it assigned every customer a person, that’s when it got beyond, beyond helpful for the customer. It was unbelievably difficult at that point, because then they started hiring inexperienced workers to quote unquote “service” the one-on-one person that they were quote unquote forced to do by the government, so it was kind of like, it was they hired a lot of people that weren’t qualified and they split the process up and they didn’t even move the correct people in the right place. I was actually in underwriting and they moved me to a customer service position. So a lot of the people that were doing a lot of the actual, you know, legwork weren’t even put into the type of position that they should have been aligned into, which, you know, made everybody crazy. YS: Now, let’s say there’s a deviant person there (laughs) who actually approves a modification. One of these frontline people doesn’t get, isn’t with the program and actually approves a mod, or recommends a mod. Then what happened? Then what would happen? BE: Well, basically, either that responsible person basically will lose control of that file. Because at that point it may go to a third party, and if there’s any issues, they will not get answers. They’ve now made an excuse, since the supposed order that they have one person one agent, they have now split up the process. So many different people are now on a file that there’s no communication between person #1 and person #10, whereas before the order there was only about three people, three to four people involved. After the order, they made sure that it was ten people and they made it even more difficult. So let us have no doubts about what is going on As we’ve said repeatedly, servicers have never wanted to do mods because it is more profitable for them to foreclose. And the Federal regulators are fully on board with this practice. They enter into limp-wristed consent orders that allow them to have good photo ops while homeowners and investors continue to be thrown under the bus. Remember, it’s not just the borrowers who might be salvaged that lose, it’s also pension funds, insurers, foundations and individual investors, not to mention afflicted neighborhoods and communities. And Bank of America continues in these flagrant abuses, secure in the knowledge that no one in authority will go after it, and now with the belt and suspenders protection of its nearly completed program to rid itself of Countrywide loan servicing. Nicely played. *Note that the special treatment of California borrowers does appear to be the result of the monitor’s action, since the California Homeowner’s Bill of Rights, which also bars dual tracking, did not before effective until 2013. This entry was posted in Banana republic, Banking industry, Legal, Politics, Real estate, Regulations and regulators on February 21, 2013 by Yves Smith. As regards Cali, it figures it was a sole and fearless individual versus a government entity in its entirety, I certainly wouldn’t give the STATE of California any credit for it. For example, why is the Federal government silent when the State of California broke the Federal Law in forcing the disabled and unemployed to receive legally mandated payments via a forced Bank of America Card contract versus those payments being directly deposited into a credit union, or bank, of their choosing instead of a bank they have every right to despise and certainly not trust holding their personal information which they never consented to. I would provide a useable link to the AP/Washington Post Article (it used to be: http://www.washingtonpost.com/business/report-unemployed-people-pay-millions-in-needless-fees-under-state-run-payment-card-programs/2013/01/28/989e9974-699f-11e2-9a0b-db931670f35d_story.html ) which revealed that tiny Cali Fed law breaking tidbit, which I accessed via this, 01/29/13, Common Dreams piece, but the Common Dreams WAPO link is not currently working apparently, and unfortunately Common Dreams neglected to note that Cali was breaking a Federal law in their AP/WAPO excerpt. One good thing about “dead trees nooz” was that it was pretty much laid in concrete and couldn’t be disappeared, like that url has all of a sudden disappeared …. within under a months span of time. Another fine reason for the Administration to support IP maximalism under the pretext of Hollywood “jobs”: those with an interest in doing so can recall and/or revise the public record as suits them, without any pesky users of Save As… buttons to challenge the record’s authenticity. There are lots of good free “screen-shot” programs. Next time you read something important you can take a pic of it for posterity. I usually take screen shots using the ‘puters hot keys, which, on my computer, are FN PRTSC. Problem is, if I were to take them of every piece I think might later be disappered, I’d have both: no time, or ‘puter’ memory left. I actually did take a number of screen shots regarding that bank card issue though. And the bank’s CEO gets $11.1 million in restricted shares for all that hard work. Welcome to the Banana Republic! I worked in the BofA’s IT trenches for most of the decade 2000-2010, much of that time next door to BofA’s pre-Countrywide-acquisition HELOC Web site development team. While BofA’s IT is indeed a complex Rube Goldberg accretion of systems of many different vintages, platforms, and origins, one should not underestimate the skill, inventiveness, and motivation of the portion of BofA’s technical staff that is not outsourced (presuming some still exist). They can do — and do well — virtually anything technically feasible that management provides adequate resources to accomplish. If BofA did not implement systems to bridge the gap between legacy mortgage processing and what they agreed to in the consent order, it is not due solely, or even primarily, to technical difficulty. It is because BofA top management knowingly so chose, either directly or because they had already voluntarily sloughed off the requisite technical know-how. I have to beg to differ. The BofA legacy systems had their data imported into the Countrywide system. Legacy system info pre the 2008 import can be accessed only by ordering a screen image which comes back in pdf form. If that’s what you are referring to, that can be fixed, but that is NOT the problem. The problem is no verifiably accurate information about a borrower exists in the BofA system. I’ve spoken to former Countrywide execs. The Countrywide platform, which was custom, became the platform into which everything else was imported. But BofA does not do custom. It like designing specs and handing stuff off to outside vendors. And it lost lots of key Countrywide staffers how knew how the system worked. This is precisely the evidence we need on the ground so that we can make a true evidentiary record to counter the willful blindness of so many judges, if that is even possible. Onboarding issues, Automation errors and zero urgency have resulted in gross Negligence. It would sure be nice if there were an IT whistleblower who had squirreled away some memoes that warned executives of these deficiencies. So far, there haven’t been any IT whistleblowers, but IT is a huge part of the story. Reading this made me realize global warming has nothing to do with carbon dioxide emissions. The devil is building thousands and thousands of new bonfires in hell, preparing an eternal reward for an entire generation of banksters and mortgage criminals. And the heat is filtering up through the earth and warming the atmosphere. This is so self-evident to the sensitive mind that no scientific study need be called upon to prove its veracity. It simply is a fact. So maybe the EPA can take over the case against these criminals, since the Justice Department can’t tell Satan from Santa Claus. Nothing like a good metaphor approximate the indescribable. With respect, I have become weary of the approach to the analysis of the “foreclosure crisis” which frequently mentions fraud on the investors in the same sentence as fraud on the homeowners. The effects of the two frauds are not the same. Investors may lose money but homeowners lose their homes. It is unclear if the investors actually lose money because of the private mortgage insurance payments (see the MBIA suit against Bank of America for the Countrywide REMIC insurance claims) but the homeowners lose the place where they live and have their lives. If the investors haven’t caught on by now that they should have insisted that the REMIC trustees should work with the homeowners to reinstate payments in order to mitigate their losses, I can only assume that the losses are imaginary and they have already been paid. It is not the homeowners who created the securitization bubble, failed to collateralize the trusts, created the circumstances leading to the deflation of real estate values, or engineered defaults. The frauds and their consequences are different. Saying that the investors losses are equivalent to or, per the Schneiderman approach, more consequential than forging documents to confiscate people’s homes is an invalid analysis. What is chilling is that the most obvious crimes to prosecute have been ignored while the complex analysis of losses to the investors has been retained as matters of greater concern. Real estate is real. Accounting entries in a computer ledgers are fiction, supported only by a belief in their value. This is not to say that I do not appreciate your fine exposition of the issues, but as a lawyer representing homeowners who has been immersed in trying to expose the systematic push to turn homes into bookkeeping entries to satify claims of undisclosed parties, I become weary of the false equivalence between the real and the fictitious. 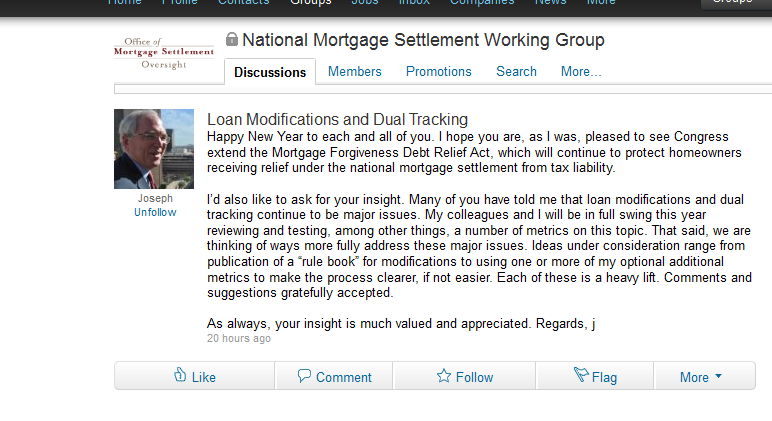 An interesting investigation would involve tracing the proceeds of foreclosure sales to see to discover where they go. To what entity the funds are those proceeds ulimately paid? My guess is that the funds go to the US Treasury, via Fannie, Freddie or the Fed after the servicers and their henchmen get their cut. I have written ten posts on this topic (Bank of America whistleblowers) and have probably mentioned investors all of three times in roughly 50,000 total words. Your reaction is disproportionate and unwarranted. And if you were on top of the investor side of this you would know that they’ve effectively been denied access to the court for remedies. Some of it is in the design of the RMBS themselves (minimum % of investors have to join together to sue), some of it is agency problems (there are “fund managers” who are often described as investors but who are really fee whore agents who can’t be bothered to do right by their clients). But it has also been adverse and strained bank-favoring rulings by judges who don’t want to rock the mortgage-industrial complex. THANK YOU Old Soul. I don’t doubt Yves almost singular committment to righting the wrongs homeowners have suffered. But I agree that in general that Mr. and Mrs. Joe Blow homeowner are seen as victims of their own ineptitude while outrage over the losses of the very investors who created this mess, and, in fact, were complicit in creating it, has grown louder and louder. The ruling class of the press, regulators, lawmakers and the like just cannot relate to poor schumcks who should have known better because they think it could NEVER happen to them. But they see themselves in the RICH schmucks who should have known better and act accordingly. Thanks for the links ….but not sure I get what you are getting at re: my post above. I’ve asked this question a number of times before, but never seem to get an answer for: exposing the “fraud” or what ever name one may put on this, accomplishes what? It doesn’t solve the problem, doesn’t give relief to those victemized, but does seem to embolden the fraudsters. Are we to understand that the whole government is corrupt, complacent, that everybody today will live under a criminal system? As far as a general strike goes, what about an armed insurection? After all, I do believe that the population is perhaps just as well armed and train as well, along with being screwed by the oligarchy, who I might add, are not immune to the same treatment of those who are in the crosshairs. Fear may be the rule of the day, but, overconfidence also causes the pendulum to swing in the oppiset direction. You are wrong that this does not help the victimized. Utterly wrong. No judge took robosigining seriously even though foreclosure defense attorneys had been raising the issue in court for two years until the media took note. It woke judges up, produced reforms in some states, such as the tough certification requirements in New York state and homeowners’ bills of rights in 15 states. In California, the settlement monitor (as this post attests) has led to some abuses being curbed. Even though dual tracking continues, it is also apparently at a lower rate too. And perhaps most important, many judges were deeply offended by the idea that fraud was perpetrated on courts and are more sympathetic to borrower arguments. Similarly, foreclosure attorneys have been screaming about document fabrications for years. This series is helping to crack the official denial around that (I have some seriously policy people trying to carry this issue forward). And finally, it also encourages more whistleblowers to come forward. The more proof that legal abuses are happening, the harder it is to deny that Something Needs to Be Done. So just because you are ignorant of progress does not mean there is no progress. So I thought I would do my two cents to help. Here’s the White House’s comment form. Takes under 60 seconds for everyone to email this story’s link to the WH, with some appropriately enraged short comment. Your last sentence, did I rub you wrong? I appologize if I did, but I’m not ignorant to progress, you’re just too far away from being effected to understand what I’m saying. Still, just how will the people who have been screwed be compensated, or will they just be permanent roadkill, having been thrown under the bus, so to speak. WTF is the point of electing Democrats, including a Democrat president twice now? Somebody remind me. do not forget, BOA switching original account number, to hide their fraud ! I asked for a mod in 2009 on my house which I bought in 2008, I was told by my bank (bald face Chase) that I needed to be 90 days late before they could discuss the matter wink wink nod nod. In other words take a $3,000 vacation from your mortgage and then call back. Ninety days later I called them and was flatly told within a minute I make too much money to qualify, a fact they knew when they “advised” me to skip three payments. I decided to move away and simply let the house go back to the bank, in a year the value dropped by 25 or 30%, I could not afford the consequences of a short sale, which they were not going to approve anyway, and in the meanwhile they had taken over WaMu and my checking account and stole almost $1,000 in fees for an error AllState made by double billing my car insurance. Later that year I relented and did a workout deal with Chase to resume the payments and have arrears tacked on to the end of the loan so my credit would not continue to be gutted, they said send us the December payment on time and we will get the paperwork to you to sign within 4-6 weeks. They took that payment and applied not a cent to interest or principal, they took it for fees and late charges, and etc. when I called them they flatly said there was no such workout agreement. A week later they slapped a foreclosure notice on my door so I moved out. That was February 2010, they rescinded the foreclosure as soon as I moved out and there the house and I sit in a blank gray legal limbo. Every single month a new late pay is entered on my credit report. My fico is now about 300 where it was 780 when I bought the house. I have zero rights, none. And because they did not sell the house on or before the end of 2011 I get none of the settlement cash from any of the settlements, along with about 4 million others that were tricked and ripped off. The only way I now have to get out from under this is chapter 7. But, if I am forced that route I will file and then leave the USA for good. Anybody that refuses to see that we are now the slaves of our fascist corporate government and totally void of rights is going to learn the hard way one day that they only have what they have because they have not yet pissed off a corporation. When you do you will see just how many inviolable rights you have. Might wanna consider Norman’s comment above for moderating, imo. Anger can be a good thing. Look at the stories just in this thread. People ought to be outraged. I’m not sure exactly what Norman meant with his reference to “insurrection,” but anyone holding the belief that ANY of these problems and gross injustices will EVER be solved through the democratic process — such that is — is in the grip of fantasy and delusion. Do you see evidence to the contrary? I don’t. I’m not avocating anything. This is just a conversation. He is basically saying the work I do is pointless. This is awfully close to throwing his drink in the face of the host (which we have said is grounds for getting the heave-ho). People who don’t like what we do should go read other sites rather than trying to hector us into changing what we do. I often wonder whether people like that are on the side of banks and this is just a new, shrewder messaging strategy. This sort of “only extreme action is worth doing” when that clearly is not in the cards in the US winds up encouraging apathy and passivity. OK; it didn’t cross my mind that he meant it as a slight against your work. I think your work is indispensable. Not only is BofA switching orginal account numbers, they are taking the Countrywide/BofA accounts and assigning them to new servicers, with different account numbers. 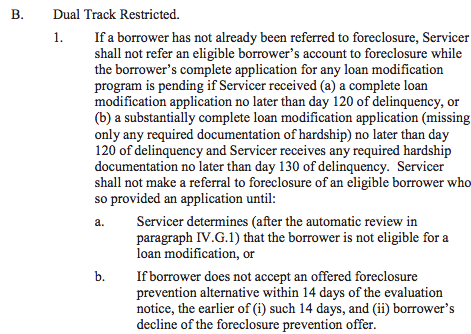 I think this is to get them out of the Independent Foreclosure Review (FUed) system. In Sept.2012 I received a notice that my Foreclosure Review was still in review, and then 2 weeks later I get another notice that my servicer will now be SPS out of Utah. Let me tell you, this has been going on with me since I signed a modification on August 10, 2006, and they sent foreclosure papers to me on August 15, 2006. I got the same message, just ignore the foreclosure, and continue to pay the modification, and the payments on the modification were paid for a solid 9 months, until one day, they said I wasn’t complient, and returned my modification payment to me in June of 2007, and I am still fighting with them right today. When the good Senator of Ohio said “Stay in your homes” fight for what you worked so hard for, I took that to heart. I am fighting everyday!!!!!!!!! If they were going to the RIGHT thing, they would simply void all mortgages made between 2000 and 2011. After all a contract that is contaminated by fraud is not enforceable. Even when the letter of the law is followed a contract may not be enforceable if the spirit of the law is violated repeatedly and intentionally in order the the party in a superior position may profit outside the scope of the original contract. We need vast new banking laws that define exactly what a bank is and may do and prohibit all other functions, with a total firewall between banking and other activities. We need aggressive regulators that will arrest crooks, and we need to put the Fed out of business. It would not hurt to have a tax on all bank profits that render them profitable but do not give them incentive to increase profit at the expense of the people, ala utilities. The people running the banks are the problem, and the government is aiding and abetting their crimes to this day. It seems to me that there is really no way to win with this situation. Well maybe that is not true if enough folks stopped dealing with BOFA perhaps that would see the light. I would never deal with them, I bought a new car some time back and it was financed with BOA, I refinanced it with my Credit union after one month once I realized what had happened at a lower rate I might add. I think that when folks deal with them as if they were an honest enterprise they bestow on them legitimacy they do not deserve. I would like to add that I have not dealt with a Bank since 1992, I have only accounts with Credit unions and have excellent experiences. I closed my last Bank account in 1992 after the back had changed ownership 3 times and the last two dealings I had with them were wrong, I cashed a personal check and received twice the correct amount, the same thing happened to my wife. what if you were to create a killer headline? I mean, I don’t wish to tell you how to run your website, however what if you added a headline to maybe grab a person’s attention? Hell’s Cargo is dual-tracking as well. Had a client lose a house two weeks ago, with a long sale and a loan mod pending. Worse, the trustee and lone bidder (third party) seemed to be working from their own script, and as I’ve been to hundreds of these and conducted a couple hundred myself, this wasn’t exactly my first rodeo. On top of that, the bidder was a quick-flipper who couldn’t close his flip, so the sale has fallen through, and the bank won’t tell my client what it intends to do.